A few days ago, something on Kevin Levin’s Civil War Memory blog caught my attention. 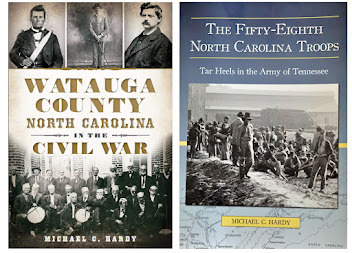 And while I’m not going to speak for the South as a whole, I will address a few questions and refer to my research into western North Carolina. Kevin was referring to a interview by Noah A. Trudeau and brought out some interesting points. However, I think Kevin might suffer from too many viewings of Gone with the Wind. Kevin seems to have a problem with the idea that there were “bonds of intertwining trust” between master and slave formed during the war, much less that they might have existed before the war. Kevin writes: “I have no doubt that the war probably brought master and slave together in close contact and I have no doubt that certain bonds were formed. The problem for any historian researching this, however, is that there is almost nothing available to help fill in the blanks.” Here is my rub: while in some instances the war might have brought master and slave owner together to form bonds, in many instances, those bonds were formed many years prior to the war. I’m sure that for some masters, or maybe better put, the sons of slave masters, this closeness might not exist. For the vast majority of slave owners, there was no big house, with rows of slave cabins tucked neatly off in some field, not visible from the house. The slaves, usually just one or two, lived in the house with the master. I’ve encountered this on two or three occasions here in local research. At the McElroy House in Burnsville, the was never any evidence of slave housing, but passed-down stories of how the slaves lived in the house, in a room over the kitchen. Also, in the Bethel community in Watauga County, with the Farthing family, this was the same story. No slave housing. Their slaves lived with them. Since the vast majority of slave owners owned only a couple of slaves, and at times (or maybe full-time) they lived in the same house, adjusting to having slaves in the army would not have been nearly the ordeal that Kevin makes it out to be. Kevin writes: “ The one topic that I am trying to wrap my head around is the way in which the war shaped race relations in camp. The war forced slaves and masters to confront one another in an environment that was unfamiliar to both.” What would be unfamiliar? I broke down the 1860 Watauga County Census. There were 104 slaves in Watauga County, owned by 30 men and one women (31 total). Of these, 20 owned 3 or fewer slaves. If we take out the one woman, that leaves 19. Of that 19, 10 served in the army. Seven were enlisted men, one was a colonel, and the other two were lieutenants. Plus, as folks have often said, slave ownership effected more than just a slave owner. Masters frequently rented out their slaves to help their neighbors at certain times of the year to help with different manual labor projects. Estimating this number is next to impossible, but, the idea of a small farm owner who has hired a slave for a day or week sitting on a horse watching others work (once again, a Gone with the Wind idea) is absurd. Like the small slave owner, these men would have been in the field working side by side. So, for an unknown percentage of men in camp, having slaves, or even freedmen serving alongside, or working alongside the men in the ranks, is not that hard of an idea to grasp. A certain percent of the population had lived with men and women of color, and had worked in the fields with men of color. It case you have not heard, Wal-Mart chose not to build their superstore on the Wilderness battlefield in Virginia. This is something we have all been working against for some time. Maybe Wal-Mart will take the next step and donate the land to the National Park Service, or Civil War Trust… Maybe. You can learn more by visiting this press release by the Civil War Trust. BATH – “Sometimes it is the little stories that matter,” said Leigh Swain, site manager at Historic Bath. Many of those stories are contained in letters from Washington County ’s Bowen family showing the home front side of the Civil War story. A new display at Historic Bath, “The Civil War at Home: Uncovering Local History Through Family Letters,” will highlight some of the ways readers can glean bits of local knowledge 150 years later through personal letters exchanged during this pivotal era in American history. Canteens, spectacles, binoculars and belt buckles from the Civil War era will be on display through 2011. Based on these letters, Historic Bath staff member Bea Latham will give a lecture titled “A Woman’s Place was in the Home: Learning about Life Through Civil War Letters” on April 16 at 10 a.m.
“Sometimes when the men went away, the wives were left to hold the pieces together,” Swain observed. In addition, the commemoration of the Sesquicentennial of the Civil War will be underway with programs, educational symposia and re-enactments throughout North Carolina . Activities for life-long learners, travelers, teachers and school children will feature the theme “ North Carolina and the Civil War: Freedom, Sacrifice, Memory.” For additional info rmation visit http://www.nccivilwar150.com/. For info rmation about Historic Bath call (252) 923-3971 or visit www.nchistoricsites.org/bath/bath.htm. The Historic Bath office is located at 207 Carteret Street , N.C. 27808 . Historic Bath is part of the Division of State Historic Sites in the N.C. Department of Cultural Resources, the state agency with the mission to enrich lives and communities, and the vision to harness the state’s cultural resources to build North Carolina ’s social, cultural and economic future. Information on Cultural Resources is available 24/7 at http://www.ncculture.com/. Here is our next set of 20 questions, with a special thanks to Chris Meekins! 1) Q. The Confederate Veterans camp in Elizabeth City was named for what Pasquotank-born Confederate officer? 2) Q. What US Congressman was captured in Currituck County (Coinjock) in 1864 but immediately released in Pasquotank County (Elizabeth City)? 3) Q. How many times did United States forces occupy Elizabeth City in 1863? 4) Q. How many guerrilla fighters did General Edward A. Wild hang in Pasquotank County in December 1863? 5) Q. Who burned the Pasquotank County court house on February 10, 1862? 6) Q. In the Battle of Elizabeth City, what did USS Valley City quarter gunner John Davis do that earned him a Congressional Medal of Honor? 7) Q. Who met the Union forces at the Elizabeth City wharfs immediately after the engagement on the river ended? 8) Q. In what language did Rowland Martin Hall of the 3rd New York Cavalry greet Mayor John C. B. Ehringhaus of Elizabeth City when they met in October 1863? 9) Q. How many Pasquotank County women did General Edward A. Wild hold hostage for the safe return of some of his soldiers? 10) Q. Who was ambushed and killed by guerrilla fighters near New Begun Creek in lower Pasquotank County? 11) Q. What still standing Pasquotank County plantation can count Las Vegas star Wayne Newton among its owners? 12). Q. Pasquotank County newspaper editor Richard Benbury Creecy, although never having served in any armed force during his long life, was known by what honorary military title? 13) Q. How did the local skirmish known as “Tuttle’s Run” get its name? 14) Q. The CSS Appomattox escaped capture at the Battle of Elizabeth City and made her way up the Dismal Swamp Canal towards Norfolk. She made it as far as South Mills but no further. Why? 15) Q. Which ethnicity was the larger percent of Pasquotank County’s 1860 population? 16) Q. When Pasquotank County soldiers were captured at Fort Hatteras in late August 1861 where were they sent to be imprisoned? 17). Q. What was the name of the Grand Army of the Republic camp formed in Elizabeth City and who formed it? 18) Q. When was the Confederate Soldiers’ Monument erected next to the court house? 19) Q. How many markers are there in the Pasquotank County Civil War Trails? 20) Q. What noted historian was born in Pasquotank County during the Civil War? A new study shows that while North Carolina still lost the most men in the war of any Southern state in the Civil War, the figures used since 1866 are wrong. Josh Howard, a research historian in the Research Branch of the N.C. Office of Archives, will discuss his work on the North Carolina Civil War Death Study on Tuesday, Jan. 25, from noon to 1 p.m. in the Government and Heritage Library, 109 E. Jones St. , in downtown Raleigh . The talk is free and open to the public. 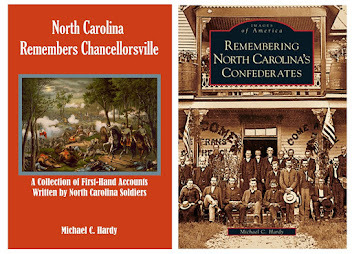 The project, spearheaded by Howard, encompasses reviewing the military records, as well as archival and newspaper accounts of military deaths during the American Civil War amongst North Carolina Confederate and Union units. The project also reveals for the first time ever the number of black and white North Carolinians who died in Union service within North Carolina ’s total losses, which prior to now have only focused on the Confederate troops. For more information on the lecture, contact Rebecca Hyman at (919) 807-7454, rebecca.hyman@ncdcr.gov. The Government and Heritage Library is part of the State Library of North Carolina (http://statelibrary.ncdcr.gov/index.html), a division of the Department of Cultural Resources, the state agency with the mission to enrich lives and communities, and the vision to harness the state’s cultural resources to build North Carolina ’s social, cultural and economic future. Information on Cultural Resources is available at www.ncculture.com. A few folks probably already know this, but many do not. This year is the 100th Anniversary of the county I call home. Avery County was formed in 1911 and is the 100th and last county in North Carolina. We’ve been working here in Avery County to create many special events and programs to commemorate Avery County’s birth. One of those is a series of newspaper articles, and to start off the series, we came up with the idea of 100 questions about the county, in lists of twenty. A couple of weeks ago, I wrote twenty questions about the Civil War and Avery County. You will find the questions below. I’ll post the answers in a few days. 1. Who was the highest-ranking Confederate officer from present-day Avery County? 2. What raid took place in June 1864 through Cranberry, Pineola, and Altamont? 3. What mine provided iron ore for the Confederacy? 4. What three Linville Falls area brothers attended the 50th Reunion of the battle of Gettysburg? 5. Which community was a stop for an underground railroad that funneled escaped Union prisoners out of Salisbury? 6. What famous couple, who both served in the 26th North Carolina Troops, later served as guides on our underground railroad? 7. Which former slave of the Avery family served in the 40th United States Colored Troops and is buried in the Peter Hardin Cemetery? 8. What no-longer existing Avery County community, renamed Calhoun in 1861, briefly served as the county seat for Mitchell County? 9. Col. William J. Martin, commander of the 11th North Carolina State Troops and post-war professor at Davidson College, was the father of which famous Avery County doctor? 10. In April 1862, David Oaks and John B. Palmer were arguing about cattle when Oaks tried to kill Palmer. According to Uncle Jake Carpenter, what happened to Oaks? 11. The raid of what Watauga County home guard camp originated in Banner Elk? 12. The community of Pyatt is named for which member of the 58th North Carolina Troops? 13. After the raid on Camp Vance, then-captain George W. Kirk had the home of Col. Palmer, burned. In what community was his home located? 14. Today in Banner Elk, an historic home, built circa 1865, is used as a museum. What Union soldier supposedly built this home? 15. John M. Houston of the 6th North Carolina Troops was the father of what famed Avery County school teacher? 16. 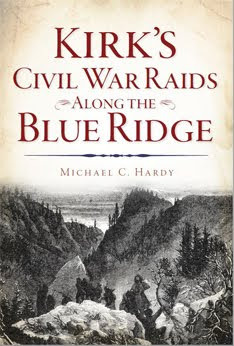 What Watauga County home guard commander led a raid into the Avery County communities of Poga, Dark Ridge, Heaton, and Banner Elk in October 1864, resulting in the Battle of Beech Mountain? 17. Which Beech Mountain resident was a Union soldier, was captured at home on leave, and supposedly tunneled out of Salisbury Prison? 18. Lt. Col. John C. Keener, of the 58th North Carolina Troops, donated the land for what Methodist Church in the Ingalls community? 19. What Banner Elk resident owned six slaves, was a stop on the underground railroad, and had at least one son in the Union army? 20. Ensor C. Wiseman, a member of four different Confederate regiments (6th North Carolina Troops, 58th North Carolina Troops, 5th Battalion, North Carolina Cavalry, and 6th North Carolina Cavalry), fought at what famous first land battle of the war in July 1861? Sometimes, usually late at night as I drive back home from a lecture someplace, I think about all of the great experiences that I have had over the past 28 years. 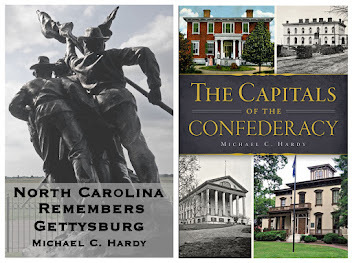 Some of these include re-enactments, like the 135th Antietam and 135th Gettysburg events; living histories like the ones at Fort Clinch; speaking engagements, like at Pamplin Park and the annual CWPT meeting on the Peninsula; and awards with which I’ve been honored, like being named North Carolina’s Historian of the Year by the NC Society of Historians, and being presented the Jefferson Davis Gold Medal in 2009. On Saturday, I added another event to that list: unveiling the conserved flag of the 58th North Carolina Troops. I spent this past Saturday at the North Carolina Museum of History in Raleigh. I had a table set up in the lobby, next to the gift shop, and sold quite a few books, while at the same time getting to speak to scores of folks about the war. About 2:30 pm we were ushered into the auditorium and treated to a rousing performance by the drum and fife corps of the 26th North Carolina Troops. After opening remarks by Col. Skip Smith of the 26th NCT, Jackson Marshall of the Museum of History spoke on the history of the 22nd North Carolina Troops. Then, descendants of the men who fought in the 22nd NCT made their way to the front and the conserved flag was unveiled. Then it was my turn. 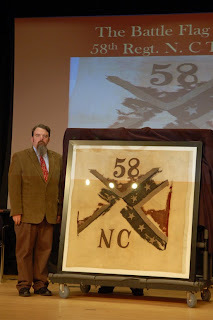 I spoke for a few minutes on the 58th North Carolina Troops, a talk that I entitled “A Fragmented History.” In this talk, I spoke of how the history of the 58th NCT, what we know about the regiment, is as fragmented as the remnants of the flag we were unveiling. Then, Skip asked that Jackson Marshall and myself unveil the flag. After the descendants arrived at the front of the room, we unveiled that flag. It was the first time I had ever actually seen the remnants of the flag of the 58th NCT in person. I was deeply moved, even more so than when I helped Tom Belton take the coverings off the flag of the 37th NCT in that very room a couple of years ago. Maybe it was because I had seen the flag of the 37th NCT previously, while it hung at Pamplin Park. 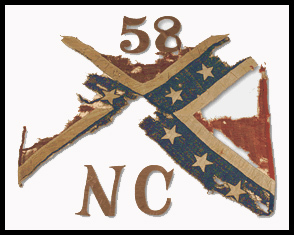 I had always worked from a photograph of the flag of the 58th NCT, knowing that it was in very rough shape. I had never realized just how threadbare and fragile those fragments were. However, my day was not finished. After hanging out for at the museum for a while longer, talking with other descendants and interested folks, we zipped over to Greensboro. The North Carolina Civil War Round Table was having a special meeting at the Greensboro Museum of History, with the one-of-a- kind Ed Bearrs giving a program about the beginning of the War in South Carolina. Saturday was a fanatic day! What a great way for me to start off the sesquicentennial of the War. I am not quite sure how I will top this past Saturday in 2011, but I sure look forward to trying. Congratulations to Col. Skip Smith and the 26th North Carolina Troops, reactivated, for their outstanding work in conserving the history of North Carolina’s role in the Civil War! I’ve been a supporter of the preservation of the Civil War battlefields for a long time – I actually have a pen here on my desk stamped with the logo of the APCWS – Association for the Preservation of Civil War Sites. I actually got the pen when I first joined many years ago. A decade ago, it was the APCWS. Not long thereafter if merged with another preservation group to form the Civil War Preservation Trust. 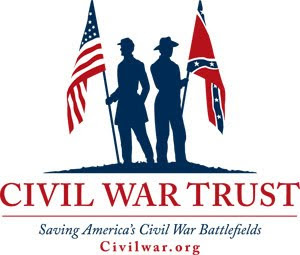 A few days ago, the CWPT shortened its name to the Civil War Trust and came up with a new logo. I guess I am going to need a new hat…. Sorry for the slow posting this week. It’s not that I’m not thinking about North Carolina and the War – I am. 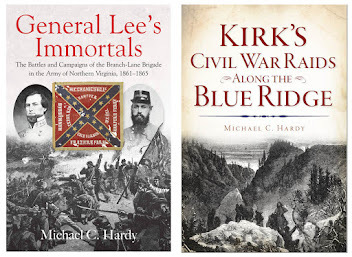 I’ve researched and written about the 29th, 39th, 58th, and 60th regiments at Chickamauga, the 58th and 60th regiments at Chattanooga, and the 1st North Carolina Colored Volunteers at the battle of Olustee. Today, I’m working on the second day of the battle of the Wilderness. 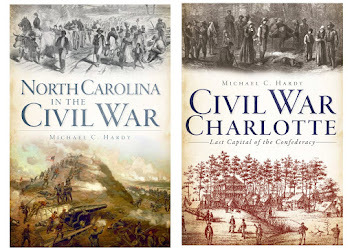 All of this is for my book Civil War North Carolina, being published by the History Press. I would like to have the manuscript turned in by March, and I still have over 30,000 words to go, so I have my work cut out for me. I have made some remarkable progress, considering that it is snowing quite a bit here in western North Carolina, keeping me home and off the roads. So, on to other news. Here are a few things going on in the state that have appeared in the news. According to this article, the preservation of the field at Kinston has grown by three acres. Three cheers for the Harper sisters. CRESWELL – Somerset Place State Historic Site in Creswell will present the lecture "The Impact and Implication of the Civil War from the Enslaved Person's Perspective: Forced to Aid My Enemies' Cause," on Saturday, Jan. 15, at 2 p.m. Former site manager Dot Redford will speak. For more info rmation, call (252) 797-4560. Somerset Place is a representative state historic site offering a comprehensive and realistic view of 19th-century life on a large North Carolina plantation. Originally this atypical plantation included more than 100,000 densely wooded, mainly swampy acres bordering the five-by-eight-mile Lake Phelps , in present-day Washington County . During its 80 years as an active plantation (1785-1865), hundreds of acres were converted into high-yielding fields of rice, corn, oats, wheat, beans, peas and flax; sophisticated sawmills turned out thousands of feet of lumber. By 1865, Somerset Place was one of the upper South's largest plantations. From Somerset 's earliest days through the end of the Civil War, pe opl e of different races and different legal and economic status lived on the property. A labor force of almost 200 men, women and children was assembled before 1790. They were black and white, enslaved and free. Over the life of the plantation three generations of owners, around 50 white employees, two free black employees and more than 850 enslaved people lived and worked on the plantation. The present-day historic site includes 31 of the original lakeside acres and seven original 19th-century buildings. With the goal of accurately representing the lives and lifestyles of the plantation's entire antebellum community, the N.C. Department of Cultural Resources has acquired the reconstructed Overseer's House and reconstructed one-room and four-room homes representative of where enslaved families once lived, along with the plantation hospital. The commemoration of North Carolina ’s Civil War 150th anniversary (http://www.nccivilwar150.com/) is sponsored in part by the North Carolina Office of Archives and History, within the N.C. Department of Cultural Resources, the state agency with the mission to enrich lives and communities, and the vision to harness the state’s cultural resources to build North Carolina’s social, cultural and economic future. For info rmation on other Civil War-related events, see the sesquicentennial calendar at http://hscal.ncdcr.gov/civilwar150/default.aspx. For more info rmation on Cultural Resources, visit www.ncculture.com. Program on the flags of the 22nd and 58th NCT regiments this Saturday. Probably two years ago, I started prominently displaying photographs of Confederate flags which were the focus of the conservation fundraising efforts of the 26th North Carolina Troops, reactivated. I’m not a member of the 26th NCT, but I believe in what they are doing, and I want everyone to know that they can help with these worthwhile projects. As an aside, I know that other groups are working on raising funds to preserve flags as well– send me a link to your web site and a photo of the flag, and I’ll put it up. Back in May of 2008, I had the privilege of speaking at the North Carolina Museum of History when the conserved flag of the 37th NCT was unveiled. 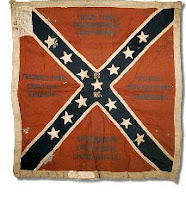 This flag is held by the Museum of the Confederacy, and in 2008 was placed on long-term loan at the North Carolina Museum of History. You can see a post about the event here, and the flag on display here. This Saturday, I’ll be in Raleigh again, this time speaking about the 58th North Carolina Troops as their flag, along with the flag of the 22nd North Carolina Troops, is unveiled. Both flags have been sent to the conservators and both are back. The flag of the 58th NCT, of should I say remnants of two flags of the 58th NCT were never surrendered at the end of the war. Many of us believe that these fragments are from a Second National and an 1864-Dalton issued flag. They were taken home by Maj. George W. F. Harper of Caldwell County at the end of the war, and his descendants gave the pieces to the Museum after the turn of the century. The flag of the 22nd NCT is a 3rd issue Richmond Depot flag that was given to the regiment in June 1863. The flag was captured by a member of the 42nd New York during the battle of Gettysburg. It was taken to the War Department and given number 76. In May 1905, the flag was returned to the state of North Carolina. Three cheers to the folks in the 26th North Carolina Troops, reactivated, and the work that they are doing to preserve North Carolina’s history. If you are at the program on Saturday, stop by and say hi! The event begins at 2 and is free to the public. FOUR OAKS — After months of being closed for plaster repair work, the Harper House at Bentonville Battlefield State Historic Site re-opens today for guided tours. Tours are given on the hour beginning at 10 a.m., with the last tour at 4 p.m. Admission and tours are free to the public. During the 1865 Battle of Bentonville, the Harper House was used as a field hospital by the Union Army’s XIV Corps. 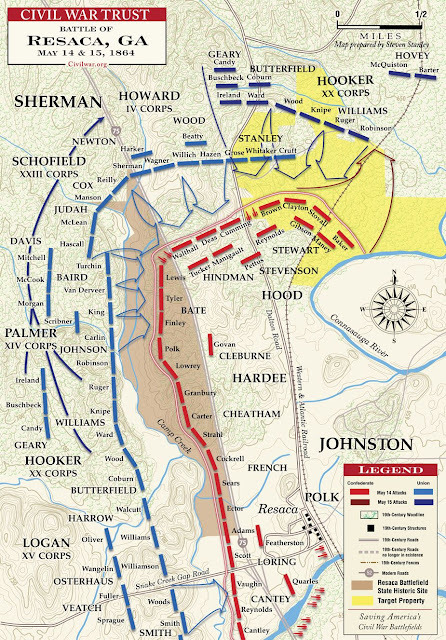 Nearly 600 Union and Confederate soldiers were treated in the home during the three-day battle. Eleven members of the Harper family were forced upstairs while the downstairs was used as a hospital. The home was lived in after the battle until 1957, when it was purchased by the state for conversion to a house museum. Bentonville Battlefield is located at 5466 Harper House Road , Four Oaks, NC 27524, three miles north of Newton Grove on S.R. 1008, about one hour from Raleigh and about 45 minutes from Fayetteville . The address is 5466 Harper House Road , Four Oaks, NC, 27524. For more info rmation, visit www.nchistoricsites.org/bentonvi/bentonvi.htm or call (910) 594-0789. Bentonville Battlefield State Historic Site is part of the N.C. Department of Cultural Resources, the state agency with the mission to enrich lives and communities, and the vision to harness the state’s cultural resources to build North Carolina ’s social, cultural and economic future. For more info rmation on Cultural Resources, visit http://www.ncculture.com/. A couple of months ago, I was out on a ramble. Not exactly a ramble – I was taking pictures for a local magazine I write for, but I was hitting some old cemeteries as well. 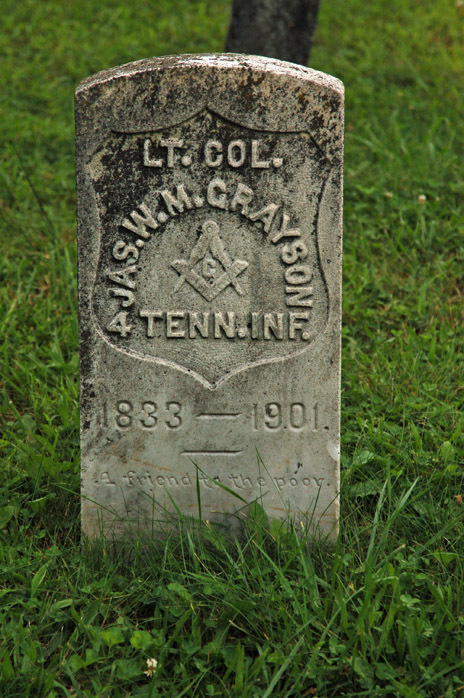 In the Zionville Baptist Church Cemetery, in Watauga County, just a hundred yards or so from the Tennessee line, I came across the grave of Lt. Col. James W. M. Grayson. Grayson was born in North Carolina in 1832. At some point prior to 1860, he moved to Johnson County, Tennessee, where in 1860 he was living, giving his occupation as that of a farmer. Grayson was one of many who worked hard in an attempt to keep Tennessee out of the Confederacy by attending several of the meetings held in 1861 for that purpose. 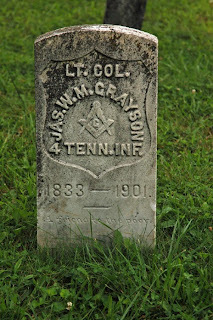 Grayson was appointed adjutant of the 4th Tennessee Infantry (US) on December 20, 1862; reported sick and in the hospital in Louisville, Kentucky in April 1863; appointed lieutenant colonel on May 1, 1863; September 9, 1863, relieved of command and mustered out of the regiment. He was mustered out to accept a position in 13th Tennessee Cavalry and then was appointed major on November 12, 1863, in the 13th Tennessee Cavalry, at Camp Nelson, Kentucky. He resigned April 1, 1864, by reason of “For the good of the service.” In October 1864, Grayson was appointed (or elected) one of the electors for the presidential (US) election, representing Johnson County. After the war, Grayson served a term in the Tennessee legislation (1867-1870). Grayson was living in Johnson County, Tennessee, in the 1870 census, with his family. He reported his occupation as that of a lawyer. 1880 found Grayson still in Johnson County. It is possible (as reported in the notes of the Andrew Johnson Papers), that Grayson moved back to north Carolina between 1880 and his death in 1900. You are probably more familiar with Grayson through a song made famous by the Kingston Trio in the 1960s: “Hang Down Your Head, Tom Dooley.” It seems that in July 1866, Thomas Dula, himself a former Confederate soldier, showed up at the Grayson farm, asking for work. Grayson consented and Dula worked long enough to acquire a new pair of boots. Not long after Dula left the Grayson farm, a posse from Wilkes County, Tennessee, arrived on Grayson’s doorstep. Dula had used an alias, Tom Hall, but matched the description that the posse provided. Dula was wanted for the murder of a woman back in North Carolina. Grayson went to find the sheriff, but was unable to do so, so he led the posse himself. They soon found Dula and arrested him, and Grayson helped transport him back to Wilkes County. It appears that the North Carolina General Assembly reimbursed Grayson $62.50 for his expenses (or was this reward money?). Dula was tried (one of his lawyers was Zeb Vance) and later hanged for the crime. RALEIGH – Burning bacon or a bridge, firing on a church or scribbling in a courthouse, moving toward or away from troop supplies, all are tales told on North Carolina ’s most recently erected Civil War Trails markers (www.civilwartrails.org). The 12 newest markers are among nearly 200 in the state, and part of a network including Maryland , Virginia , West Virginia and Tennessee . The signs, adorned with a red bugle under blue Civil War Trails lettering, can lead history buffs on a motor tour across the state and region. 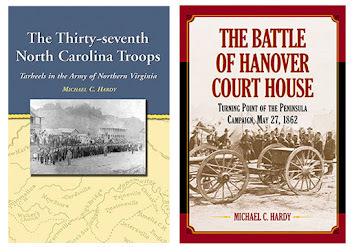 The latest additions are in Alamance, Cabarrus, Cumberland , Duplin and Gates counties, and contribute to the observance of the sesquicentennial of the Civil War (www.nccivilwar150.com). Before going off to war, members of the Gates County militia signed their names on a second-floor wall of the courthouse in Gatesville. The signatures are still visible today. In March 1863, Union forces burned the Confederate armory at Kenansville, emptied a safe of Confederate money and, more importantly, destroyed two miles of track of the Wilmington and Weldon Railroad, cutting supply lines to Confederate forces in Virginia . The Federal troops destroyed other supplies and burned a barn containing hundreds of pounds of bacon, leaving an aroma for days. The congregation of Freedom’s Hill Wesleyan Methodist Church was among the most outspoken of southern abolitionist groups. Active with the Underground Railroad, the church stated that no Christian could hold slaves. Proslavery mobs attacked the congregation, and small arms were fired at the Alamance County church. Vigilantes lynched congregant Micajah McPherson, who survived after his assailants were scared off. Members of the Quaker community also were subjected to physical and psychological violence but never were attacked directly by their neighbors. Several of the new markers denote incidents from the Carolinas Campaign, which started Feb. 1, 1865, when Union Gen. William T. Sherman led his army north from Savannah , Ga. , after the March to the Sea. In March 1865, Confederate forces burned a bridge and slowed the Union advance as Fayetteville was evacuated. 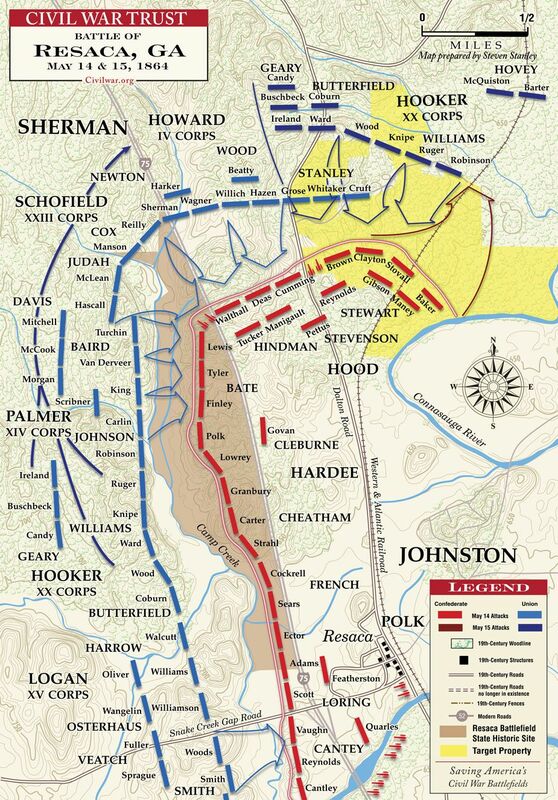 At Averasboro, Confederates delayed the Union advance before falling back to their third line of defense. Many stories of sacrifice and heroism are remembered on the Civil War Trails markers. Information and observances of the 150th anniversary of the Civil War also will be organized by the N.C. Department of Cultural Resources, the state agency with the mission to enrich lives and communities, and the vision to harness the state’s cultural resources to build North Carolina ’s social, cultural and economic future. Information on Cultural Resources is available 24/7 at www.ncculture.com.